Is the CEO practicing fraud ? It appears to be common knowledge and/or belief that the CEO of IC Places, Inc., Mr. Steven Samblis, is using false pretenses to motivate investors by using multiple aliases on message boards. It is believed that the most recent attempt to do this by using the alias “JapanInc” has been thwarted by the Administrators of Investors Hub. That alias has been suspended until March 16th, 2017 (see below graphic, click to enlarge). His other alias HollywoodFastLane has been “booted” also. It is also a widely held belief that he has used (and perhaps continues to use) other aliases such as “dotd“, “mrighttrade“, and “zurich” to name a few, in order to promote the company and attempt to appear the endorsement is coming from an independent investor or potential investor. If this action can be proven to actually be conduct by Mr. Samblis, and at this point there is little doubt by many who know his practices and writing style, this appears to an an actionable activity by the SEC. Take a look at the below graphic. It is an excerpt from an article here that details a provision in SEC regulations that regulate such activity. The SEC regulations were aimed at prohibiting “any manipulative or deceptive device or contrivance.”,which basically means any intent, action or vehicle, such as message boards, to contrive a scheme to mislead others. Let’s look at the sections a (a), (b), and (c) of the Act. (a) To employ any device (message boards), scheme (appear to be another person), or artifice to defraud. Obviously the use of an alias and indicating the writer/poster is an impartial contributor is covered by this statute. This is probably the most blatant disregard for integrity with investors. Its shameful if a CEO of a public company feels the need to deceive investors by masquerading as satisfied investor. Can he not find at least one investor that actually supports his company ? (b) To make any untrue statement of a material fact or to omit to state a material fact necessary in order to make the statements made, in light of the circumstances under which they were made, not misleading. WOW… several instances come to mind that would fall under this section, such as the use of aliases for one. Regarding the second part relating to “omit” facts that would perpetuate a false and misleading statement… how about Mr. Samblis not commenting on the $194,000. per airport deal with Clearvision. Mr. Samblis let that VERY material fact go unclarified to this day. Also, SEC 10-K/Q filings and statements regarding no lawsuits against the company (details here), and statements made regarding the president’s departure (details here). Additionally Mr. Samblis’s statements about selling shares of the company to finance ongoing operations (details here). We could go on and on but its obvious that there are many examples that would fall under this section. (c) To engage act, practice, or course of business which operates, or would operate as a fraud or deceit upon any person, in conjunction with the sale of any security. Many would argue that the entire premise of IC Places, Inc. is to sell shares of stock to finance the whimsical lifestyle of Mr. Samblis. After almost 10-years of doing business, and after 3 reverse splits of the stock, the PPS hovers just over triple zeros again. Mr. Samblis left intact the 2-billion share structure which many believe is in force to allow Mr. Samblis to sell as many shares as he needs to keep the cash flowing in. Currently, it appears, there have been several new companies initiated that are outside of the corporate veil, and many believe much of any revenue is being diverted to those companies in order to shield such from corporate investors, (details here). If any, or much, of this is accurate, those actions certainly constitute fraud and deceit upon any person in conjunction with the sale of any security. Should you agree that the above should at least be investigated by the SEC, here is the link to their complaint page. The SEC treats all tips, complaints and referrals as confidential and nonpublic, and does not disclose such information to third parties, except in limited circumstances authorized by statute, rule, or other provisions of law. There are also additional confidentiality protections if you so desire. See the enforcement tips page here for details. There is an excellent quote from Edmund Burke… “The only thing necessary for the triumph of evil is for good men to do nothing.” Will YOU further Mr. Samblis’s actions by doing nothing ? Is the CEO a liar… #2 ! Can you believe anything the CEO says ? We discussed this subject here in a previous post. That’s why we call this post number 2. WOW… something just came to mind when thinking about the CEO and number 2… but we digress. There is an ongoing controversy on the message boards about the Mr. Samblis, CEO of IC Places, Inc. selling shares of the company stock. There are numerous posts accusing Mr. Samblis of selling shares, and numerous replies by Mr. Samblis (many of his replies using his bogus aliases, dotd, mrighttrade, and zurich, etc) stating he has not sold any shares. Who is correct ? Let us be the first to say… Mr. Samblis is telling the truth… he is not selling shares. HOWEVER… its important to understand the concepts behind each position. When posters say Mr. Samblis IS selling shares, they likely mean… company shares are being distributed into the open market, thereby increasing the outstanding share count. When Mr. Samblis says he is NOT selling shares… he likely means he personally is not selling shares, and/or, he is not selling any of his “personal” shares. Keeping that in mind… lets look at the play on words/terms Mr. Samblis uses frequently. When posters accuse him of selling shares, he denies such, and makes the statement that “he has not sold any shares”. Well, in his mind that is a correct statement, because he is thinking “personal” shares. He is right (recently) when he says he has no shares to sell because he retired his personal shares. So technically he is correct in saying “he” has not sold any shares. Now, Mr. Samblis is the CEO of the company, and as such he can direct the board (which consists of himself) to direct himself (as CEO) to dispose of company stock. So… Mr. Samblis is not selling shares… the CEO is. See the difference ? When Mr. Samblis speaks (or posts a message), its important to distinguish between is it Mr. Samblis speaking on his personal behalf, or speaking as the CEO of the company. In reality they are one one in the same, but technically they are 2 different entities. Now… given the above, can poster’s accuse the CEO of selling shares… NO. Because the CEO is not really “selling” shares… he is putting them up for collateral to secure loans from firms like Asher, in order to acquire funds to operate the company and maintain his personal life, (i.e. pay himself for the superior performance he has achieved as CEO of the company). (example here) So… here again, Mr. Samblis is technically correct in saying (speaking as the CEO) that he has not sold any shares. Even though the shares have not been “sold”… they are no longer available for use, i.e. they are “encumbered”. Think of it this way… if you own a home, you likely have a mortgage on it, meaning you borrowed the money to buy it. The lender has secured a lien on the home/property insuring repayment of the loan. You can not sell the home/property until you pay back the loan, so in effect the home cannot be easily sold as you could with something you owned outright. Now, with the home mortgage scenario, someday you will pay off the mortgage and the home will be yours free and clear to do as you please. With the shares pledged to Asher, its likely the loan will not be repaid (that’s the business model of firms like Asher) and therefore the ownership of the shares will transferred to Asher… thereby allowing Asher to sell the shares in the open market to recover the funds loaned out initially (plus a very handsome profit). Think of it like foreclosing on a home to satisfy the loan on it when the homeowner defaulted on paying back the loan. Its important to understand that’s the business Asher is in. Some businesses sell widgets… Asher sells stock pledged to them by desperate companies that can’t get funds anywhere else. The practice could be called legal loan-sharking. So… the only “selling” of shares in this scenario is done by Asher, not Mr. Samblis personally, or by Mr. Samblis as CEO. So… when Mr. Samblis says he has not “sold” any shares – AND… poster’s say he HAS sold shares… can they both be right… YES ! However, as you have seen, the end result of Mr. Samblis’s actions as CEO of the company, is to CAUSE shares to be sold in the open market, and in turn cause the outstanding share count to increase. So, there you have it… semantics. Mr. Samblis is excellent at creative word choice in his press releases and message board posts. Many readers quickly read through his PR’s and postings and frequently do not understand why he uses the words he uses. However, make no mistake about it, he uses those words for a reason. There is thought behind his choice of words. Yes, he has made some boneheaded statements in the past (and will likely in the future) but overall he is extremely careful in the words he uses and the meaning behind those words. Those that use this tactic do so to deceive and mislead. Read (and interpret) their responses closely. People that have intentions to deceive and mislead will either A) deflect (some call it pivoting) to another subject to draw the questioner (and readers) off the subject of their original question, or B) shoot the messenger in an effort to discredit the questioner, thereby attempting to cast doubt in readers minds that the questioner is somehow defective and therefore lying, or C) pick and chose which questions to answer (or what parts of the question to answer), or D) use creative word choice to respond. Then, when questioned as to the meaning of their word choice, they utilize one of all of the above tactics to respond again. Its a cat and mouse game and if there is no sincerity on the respondents part, you never will get your question answered, because most likely they found the question to difficult and embarrassing to answer… and therefore never will. When reading Mr. Samblis’s responses, be they by himself, or using any of his many aliases like dotd, mrighttrade, and zurich, etc. read the words carefully and try to think about their alternative meanings, and if those alternative meanings mischaracterize the response. See if you can spot any of the above mentioned tactics used by those attempting to deceive and mislead. Then… call them on it ! As an example… posters say the T/A is “gagged”, and Mr. Samblis says that is a lie. How about if posters start saying the T/A will not give out share structure information. Our guess is… Mr. Samblis will not respond. He responds when the term “gagged” is used, but try rewarding it to read… the T/A will not give out PNCH share structure information. Each has essentially the same meaning, but the latter does not allow Mr. Samblis to say that’s a lie. See how many questions you can get Mr. Samblis not to answer. A no-answer response is in fact an answer. If he doesn’t answer the question, readers can pretty much assume the question was accurate. We wrote yesterday about the choices Mr. Samblis has made in running IC Places, Inc, and specifically the choice to bring Mr. Warren Zide on as a member of the IC Places, Inc Board of Advisors, as well as head producer for its in-house production division. We referenced Mr. Zide’s bankruptcy issues, as well as his reported financial difficulties in owing the state back taxes to the tune of over $500,000. dollars. Apparently that was not the full picture. Check out this link. Apparently Mr. Zide has something else in common with Mr. Samblis other than fiscal mismanagement… they have both been sued! Yes that’s right… you may remember Mr. Samblis’s legal issues here, where he was sued for breach of contract… well Mr. Zide apparently was sued for non-payment of a loan, and the money involved far exceeds Mr. Samblis’s legal judgement. According to the written account at the link provided above, Mr. Zide has a judgement against him (and his company Ham and Eggs, Inc.) for $750,000. plus interest. It is unknown at this time if the judgement has been satisfied, or perhaps included in the bankruptcy. However investors would likely welcome a full and complete disclosure of the situation. Most would agree, Mr. Zide’s financial difficulties are significant relative to the value of IC Places, Inc. It begs the question… will this financial situation negatively impact a) Mr. Zide’s performance (how can you keep you mind on your work with that kind of financial situation hanging over you), and b) will this financial situation have any influence on Mr. Zide’s decision making if/when he negotiates any contracts for IC Places, Inc. and/or Mr. Samblis. Perhaps Mr. Zide will have no access to either the company checkbook, and/or any financial activities of IC Places, Inc, however that aspect of Mr. Zide’s employment was not discussed in the press release about such. Mr. Zide’s financial difficulties were not discussed in the press release either. Now… you may remember the controversy over the last president’s departure (details here). 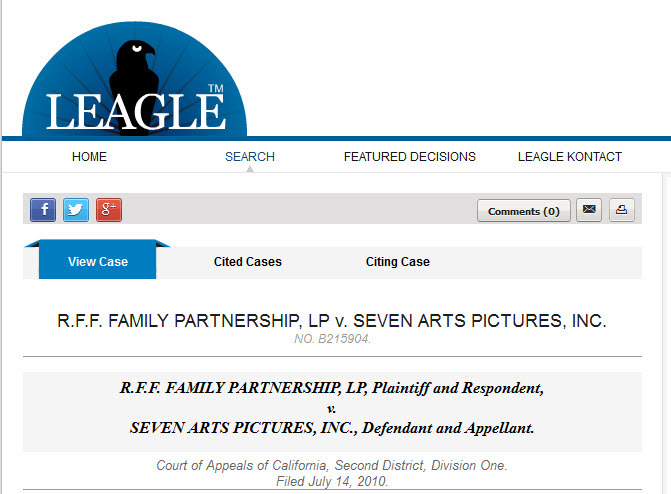 The controversy centered around the disclosure of a legal judgement. Mr. Samblis stated that the judgement was not disclosed and that was grounds for termination (although we now know that was not accurate). Well… looks like we have a very similar situation here. The situation of Mr. Zide’s apparent judgement seems to be identical to the previous president’s situation. It begs the question… did Mr. Samblis know about the judgement prior to being Mr. Zide being brought on, and if so, doesn’t that render the reason given for the president’s departure insincere? Did Mr. Zide disclose the judgement, and because he disclosed it does that mean judgements are not a factor in hiring decisions? Or, are judgements only a factor in smearing the reputation of the person should they decide to leave the company? Interesting, right? Folks… the actions of Mr. Samblis get more bazaar by the minute. What will be next ? Stayed tuned, there are likely to be more bazaar situations surface as time passes, and the saga of Mr. Samblis’s trials and tribulations unfolds. Things that make you go… hummmmm. Check out the below graphic (click to enlarge). The graphic is excerpted from this page here. Check out the highlighted filing date. 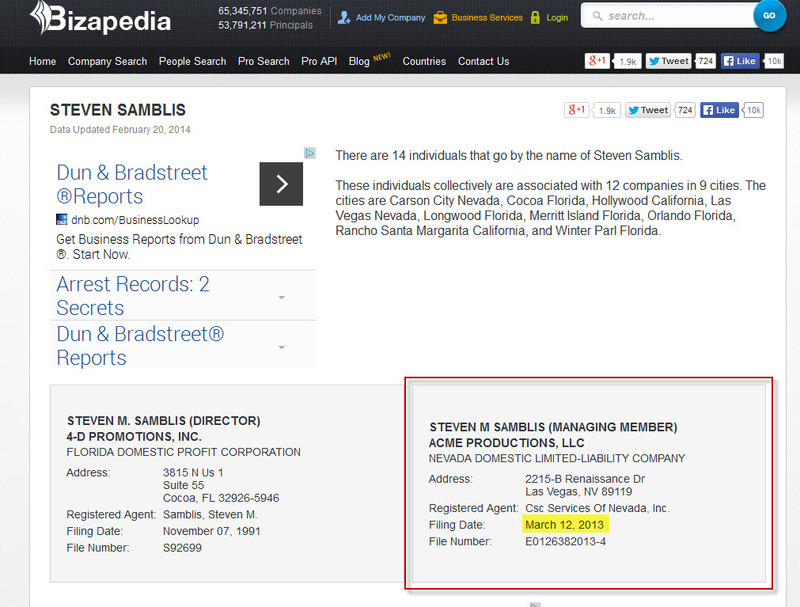 Mr. Samblis… why so many companies? (it gets even more interesting following all the links on that page). And who is Preston Blackwell ? Is this the same Preston Blackwell here ? I wonder where Mr. Samblis and Mr. Blackwell met ? What qualifications did Mr. Blackwell have to warrant being Secretary, Treasurer of IC Places ? Cutting lawns? Perhaps the above is old information but it speaks to frame of mind when making management decisions. According to Mr. Samblis’s newest associate choice, Mr. Warren Zide (learn more here), apparently his selection criteria has not improved much over the years. Apparently its hard to unlearn hard wired tendencies. They say… you are who you associate yourself with. How does a person who made millions recently, file for bankruptcy and owe the state over 1/2 million dollars a short time later ? Then, with those stellar qualifications Mr. Samblis appoints him to be on his his Board of Advisors and as head producer for its in-house production division. Should this guy be advising Mr. Samblis and running parts of the company? It appears Mr. Samblis doesn’t need any more help with negative finances, and at generating zero revenue… he is doing quite well on his own running the company into the ground ! Maybe Mr. Zide was brought on to advise IC Places, Inc. on bankruptcy ? Its something apparently Mr. Zide has experience with. You just can’t make this stuff up folks… stay tuned for more !